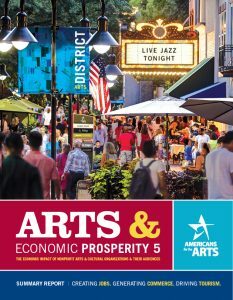 WASHINGTON (June 22, 2017) — Delaware’s arts and culture industry generates $149.9 million in annual economic activity by supporting 4,062 full-time equivalent jobs and generating $10.5 million in local and state government revenues, according to the latest Arts & Economic Prosperity 5 national economic impact study, which was released on June 17 at the Americans for the Arts’ annual conference in San Francisco. “This report demonstrates that the arts continue to be an important economic driver in Delaware, providing jobs for our citizens, generating business for our restaurants and other small enterprises, and tax revenue for our state and local governments. In addition to the important economic impacts, the arts benefit all Delawareans from children to senior citizens across the socioeconomic spectrum, and from rural communities to the cities,” says J. Mack Wathen, chair of the Delaware State Arts Council. Results show that nonprofit arts and culture organizations spent $103.6 million during fiscal year 2015. This spending is far-reaching: organizations pay employees, purchase supplies, contract for services and acquire assets within their community. Those dollars, in turn, generated $111.6 million in household income for local residents and a $10.5 million in local and state government revenues, which is approximately a 3:1 return on investment. The Delaware Division of the Arts receives state funding approximately $3 million for grants to support arts and community-based organizations, schools and individual artists. In addition to spending by organizations, the nonprofit arts and culture industry leverages $46.3 million (excluding the cost of admission) in event-related spending by its audiences. As a result of attending a cultural event, attendees often eat dinner in local restaurants, pay for parking, buy gifts and souvenirs, and pay a babysitter. What’s more, attendees from out of town often stay overnight in a local hotel, which helps support local tourism offices. “The report confirms that the arts mean business for Delaware. Investment in the arts contributes to a stronger economy and improved quality of life which attracts a talented workforce to Delaware. Delaware has countless arts and cultural events at any given time as seen in DelawareScene.com, an online calendar managed by the Delaware Division of the Arts. Corporations, small businesses and individuals looking for a vibrant location to call home should look to Delaware as a place to settle,” says Guillermina Gonzalez, executive director of the Delaware Arts Alliance. In Delaware, 95 of the 135 eligible nonprofit arts and cultural organizations participated in this study—an overall participation rate of 70.4 percent. A list of the participating organizations can be found in the full report. In addition to organizational data, a total of 1,417 valid audience-intercept surveys were collected from attendees to nonprofit arts and cultural performances, events, and exhibitions during 2016.